I’ve got a problem that started in the last week where my hard drive on my laptop fills up quickly. I’ve used Treesize Professional to check out the disk space and can see there’s huge numbers of 3MB files in the “Outlook Logging” folder buried deep down under the “C:\Users\username\AppData\Local\Temp\Outlook Logging\” path. I did some googling and found that this could be due to Outlook Logging being enabled. So I checked Outlook Logging under the Advanced / Other options in outlook and as you can see, it’s NOT enabled. I decided to further check the registry that this links to and found it too was disabled. I tried many things, even enabling logging, rebooting, disabling logging. Nothing I did would resolve the issue. One of my fellow MVPs found this MS Forum post here which suggested that the issue was due to a problem with a Mailbox in my profile. I didn’t have problems with my profile, but I did notice however that due to some server changes, one of the mailboxes I have which is linked to a clients site, was not accessible. While I was investigating the issue, I created a batch file to periodically delete the contents of the folder – quite a simple command really below where username was replaced by my userID. 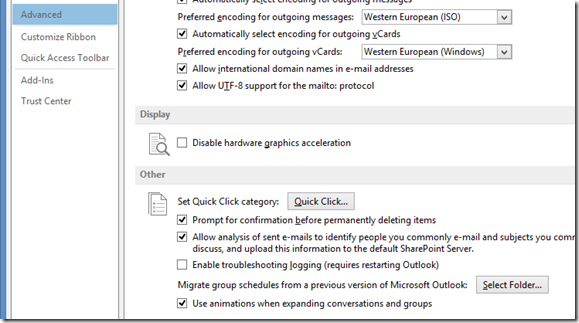 What I noticed today, while I was onsite with the client was the the files stopped logging in Outlook Logging, because it now had direct connection with the “missing” mailbox. Therefore, I’m led to conclude that yes indeed, the issue of having large numbers of files created in my Outlook Logging folder was due to the inability of Outlook to connect to a specific mailbox. 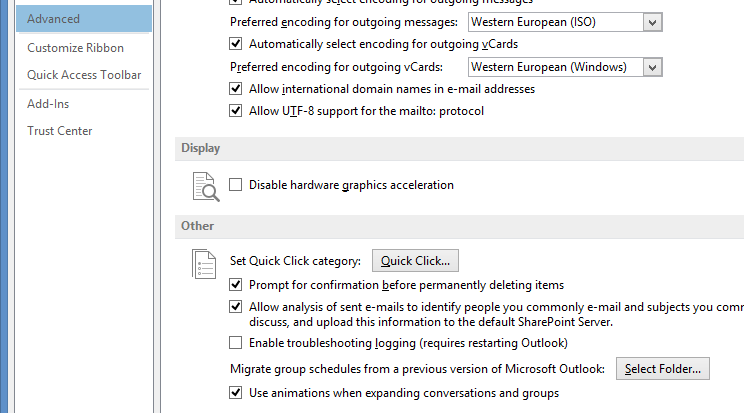 What concerns me is that I can’t find anywhere that this is documented by Microsoft as a feature of Outlook. Hope this helps someone else that might see this issue at some point. Had the same issue…after your comment, check the mailboxes. Thank you. I had the same situation but worse. I had 148GB of Outlook Logging files. It was adding 180MB of files ever 20 minutes. I found that I had an Office 365 account that wasn’t finding the server. I deleted it since I wasn’ t really using it and the log files stopped immediately. Same problem here, and quite difficult to google an answer as all you get is how to enable logging. So, just to help index this in google, my logging names all started “Pro__OUTLOOK”. And they had BeforeMove in the filename. Each file contained a shed load of dumped registry entries pertaining to a profile. Same thing here, Outlook has been set up with one account that was unlicensed in Office 365 Portal. wow – 322gb on my pc. and thats in 2 weeks where outlook couldnt connect to our server.